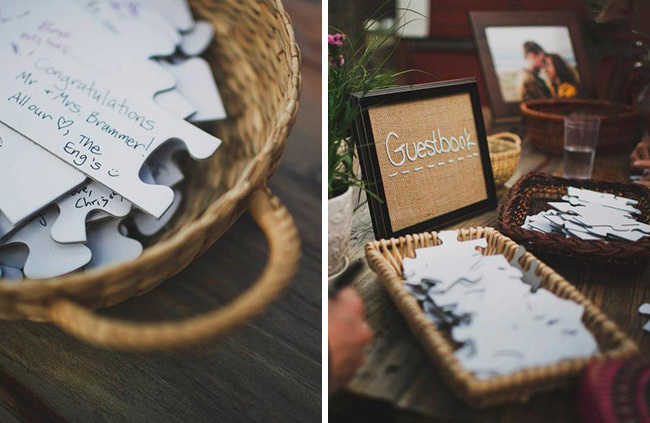 For a unique wedding guestbook idea, try a custom made jigsaw puzzle! Added bonus? You and your spouse can then recreate your wedding day over and over again! Jon and Kaley loved each other, and they loved to do jigsaw puzzles.They incorporated bits of their relationship into their wedding, and what they got was something unique, priceless, and very much theirs. Have each of your guests sign a puzzle piece from a custom made puzzle! Kaley and Jon's wedding even incorporated more puzzles—each table also had a little jigsaw puzzle for the guests to work on. Kaley said, "I really enjoyed thinking outside of the box and incorporating things that Jon and I like to do together ... It was a blast to see everyone enjoying an activity that Jon and I did together when we first started dating. Sure, it may have been dorky, but it was us!" There are several options for making your own jigsaw puzzle, including cardboard and wooden photo print puzzles, blank jigsaws, and fun shapes like circles. 99 Piece Custom Blank Jigsaw Puzzle - 16 x 24 This all-white puzzle is perfect for wedding guest books (or decorations, or craft projects, or whatever!) Each piece is 1 to 2 inches in size, perfect for a small message, and has an easy write surface that dries quickly. Custom 10 x 12, Piece Count Varies. Or you could have an image on one side of your puzzle, and have guests sign the back. Recreate your puzzle on your anniversary, reading the lovely messages your guests left you as you sort through the pieces! Custom Puzzle Tin with Custom Image on Box. Don't forget to top it off a custom puzzle tin for storage. Even if you go with the blank puzzle, you can have the perfect image on your tin that encompasses the essence of your big day!